Before you start monetize your blog with Google AdSense, you must be sure that you have some content on blog. Simply spoken, you must have enough posts on your blog. There doesn’t exist necessary number of posts, but I think that 10 posts is optimum count to start using Google AdSense on your blog (5 posts is minimum). 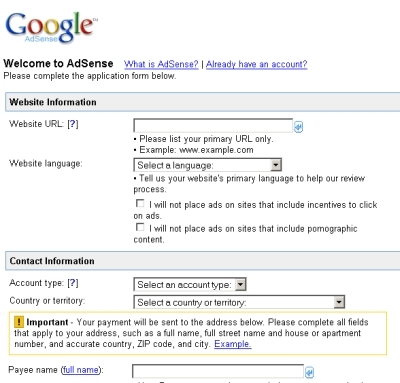 Before you can add Google AdSense ads on your site, your page will be checked by AdSense team. I am not sure, if to start monetize blog, before attract some visitors. When you don’t have visitors, you can’t earn money from blog. But on the other side, it is better to have AdSense ads on blog, and you can earn some money also with small amount of visitors. I will show you in next posts how to attract people to visit your blog. When you check your stats in Google Analytics you can have some visitors from Google or other search engines, some from blogger.com site, and some visits from your friends. How much, depends on your niche. Now I start with introduction of Google AdSense program. Google AdSense is system that shows adverts on your site. Big advantage of this system, that ads are relevant to content of your pages. You are paid, if somebody click on your ads. After clicking on ads, is visitor redirected page on clicked ad. Sometimes you can be also paid, when you show ad a lot of times. But main earnings are from clicks on ads on your site. This is why is this system called PPC (Paid Per Click). Google AdSense is the most used system on sites of the world. And usually it is the best system, how to earn some money from your site. Google AdWords other side of this system. There webmasters create ads, they want to show on other sites (This is paid system of course). From previous information, it is important to know that Google made this system fraud click safe. If you think, that you earn money by clicking on your own ads, or your friends will click on your ads and you will profit from it, don’t use this system. Because you will never see money from Google. Big Brother, Google, has many possibilities to collect information about each of us. Google AdSense check various patterns to prevent invalid clicks on ads. Once is your AdSense account checked as suspicious, it is only question of time, when you will be banned. After banning from Google you will lost all money on your account, and it is almost impossible to register to system again. There are some alternatives, but usually are these alternatives worse that Google AdSense program. You can earn more or less money. Your earnings will increase, only when you will be patient and hard-working. Before start with AdSense, you have to register your blog to program. For registration you will use your Google account. But you must fill more informations. It is important to enter correct data, especially your address. These data will be used also for sending checks. Keep in mind, that when you will enter false information, your registration can be declined. At last you must check that you read their policies (Read them carefully!!! ), that you will not click on your ads and that you don’t have another account. Then press button Submit Information. It can take 24 hour to AdSense team accepts or refuse your site. In case, that your site will be refused, read carefully reason, correct mistakes and resubmit your application. Now, the most important information: You must earn minimum 100 USD, to be paid. You will be paid 30-th of next month, when your balance reach 100 USD. More info you can find in Payment Guide. I hope that it will be soon, you will receive your first payment. In next post I will show you, how to create ads, and how to add them to blog. Many webmaster forums are full of posts with titles I am banned from Google AdSense. Why? Because most of them didn’t read Google AdSense Policies. Don’t do the same mistake. Pay Per Click is an advertising model used on search engines, advertising networks, and content websites/blogs, where advertisers only pay when a user actually clicks on an ad to visit the advertiser’s website. Ad serving program run by Google. Website owners can enroll in this program to enable text, image and, more recently, video advertisements on their sites. These ads are administered by Google and generate revenue on either a per-click or per-thousand-impressions basis. offers pay-per-click (PPC) advertising, and site-targeted advertising for both text and banner ads.